Having insurance coverage is a normal part of life, even though many people rarely file claims on their policies. Even though it is not something you may need all the time, it is something you will be glad you have if you ever need it. If you currently have multiple types of insurance coverage and purchase your policies from different insurance companies, you should consider bundling your policies. Bundling insurance involves purchasing all the policies you need from one company. If you currently do not bundle your policies, here are three reasons you should start now. The number one reason people bundle their insurance is to save money. If saving money interests you at all, bundling is a great option to evaluate. 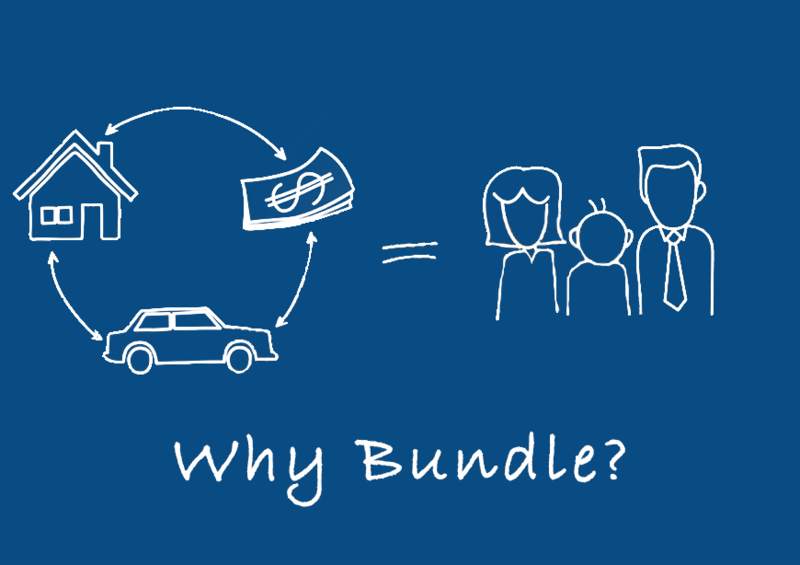 When you bundle, you allow one insurance company the opportunity to insure everything you have. This typically includes a person’s home and cars, but it can also include your life insurance policy. Insurance companies offer discounts to people when they bundle, and these discounts are often between 10% and 20% per policy. For example, if you are paying $1,200 for insurance on one car, $1,000 on another, and $1,400 for home insurance, you would pay $3,600 per year for your insurance coverage. If you bundle, you could save hundreds of dollars and have the same coverage. If you could save money and have the same coverage, why wouldn’t you bundle? Most people that bundle their insurance do so because they save a lot of money on this normal monthly expense, but this is not the only benefit it offers. You have only one bill to pay – If you pay your insurance monthly, you could reduce the number of bills you have to pay through bundling. Instead of paying two or three insurance bills, you will have just one to pay. It makes filing a claim easier – A second thing to consider is the process of filing a claim if you ever need to. If one insurance company insures everything you have, you will know exactly who to call when you need to file the claim. If your life is rather hectic and busy, any step you take to simplify it can help you save time and stress. The other benefit you can experience from bundling is the ability to build a relationship with your insurance agent. When you have just one agent helping you protect the things that are important to you, that agent will get to know you and your needs. This agent will watch out for you and will notify you if there are ways to save money on your policy. Your agent can also watch for risks you should know about. If your agent suspects a risk, he or she may call you to discuss it with you. This type of personal attention and relationship is not easy to develop if you deal with multiple agencies. If you want to fully protect yourself, the things you own, and the people you love, bundling could be the best solution. The Trottier Insurance Group is an agency that provides all kinds of insurance coverage options, including auto, home, life, health, and much more. If you currently do not bundle but are interested in learning more about this, give us a call today. We can help you save money and provide all the coverage you need. Contact us today to learn more about the products we offer.